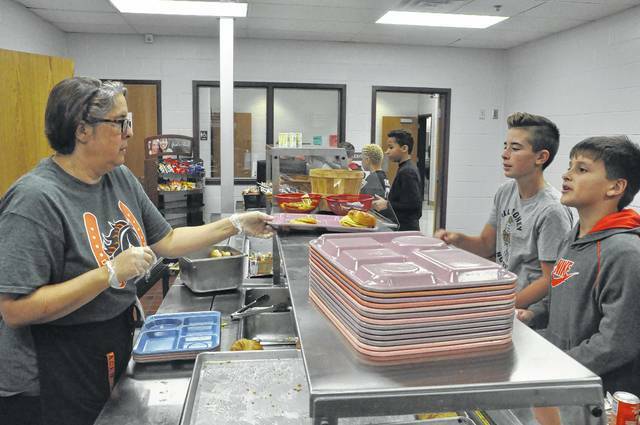 After graduating from culinary school, Liz Bertsch was used to cooking meals a la carte, but since she became the head cook at Dempsey Middle School 11 years ago she’s become accustomed to cooking for more than 600 students a day. Every day, Bertsch and her staff of nine cooks at Dempsey prepare approximately 650 complete meals for students at Dempsey as well as preparing meals that are transported to Carlisle Elementary School. Bertsch graduated from the Culinary Institute of America in New York and worked at several restaurants in Columbus before leaving the industry to be a stay-at-home mother when her children were very young. She said after her children started school, she began substitute teaching at Delaware City Schools before taking the job of head cook. More than a decade later, Bertsch still finds the job enjoyable and challenging. Bertsch said she recently made beef noodle soup for the students and said the children also liked her fajita soup. “They really like my soups, I think, or at least they ask for them” Bertsch joked. She added that she likes to regularly make different desserts for the staff at the school. Bertsch said the biggest challenge is just managing all the food and staff to get the students through the lunch line as fast as possible. For Bertsch, the challenge is worth it because she gets to be part of the community at Delaware City Schools. Dempsey Middle School Head Cook Liz Bertsch hands a tray with a breakfast sandwich on it to a student Friday afternoon. Bertsch said she and her nine staff members serve more than 650 complete meals a day, not counting all the students who only buy part of a meal.